If you love the idea of a ring with a precious gem but you want something a little more colorful than a diamond, a sapphire engagement ring is the perfect choice. Sapphires are made of the extremely durable and beautiful corundum, a material that comes in a range of colors. You'll also find a wealth of stone shapes, setting styles, and designs, proving that the sky's the limit when it comes to this type of engagement ring. Click the "Buy Now" button on any of the following images for purchasing information. If you're a fan of classic styles and simple beauty, a sapphire solitaire could be your dream ring. This exquisite ring features an 8 x 6mm natural emerald-cut deep blue sapphire set in a simple 10k white gold band. This ring retails for about $340. A three-stone engagement ring is a beautiful traditional choice, especially when the center gem is a blue sapphire. This beautiful 14k white gold ring features a 0.50-carat princess-cut natural blue sapphire flanked by two 0.25-carat princess-cut diamonds. It retails for just over $700. For a twist on the traditional, choose a sapphire engagement ring with pave-set diamond accents. This spectacular 14k white gold ring boasts dozens of sparkling, colorless, pave-set diamonds on an intricate band that surrounds a glowing 1.05-carat round brilliant-cut sapphire centerpiece. This head-turner retails for about $1,500. This beautiful marquis-shaped blue sapphire ring offers a gorgeous and unique look. This ring boasts a lot of sparkle with an oval cut center sapphire surrounded by two halos of tiny diamonds set into a marquis shape. The ring is set on a 14k white gold band encrusted with more colorless diamonds. The ring retails for approximately under $560. Sapphires were popular as engagement ring centerpieces in years gone by, and many modern rings take their inspiration from antique styles. This sterling silver Art Deco-style ring features elaborate filigree and carving. A .35-carat brilliant round blue sapphire sparkles from the center of the embellished band that also features tiny diamonds for extra sparkle. This ring retails for just around $80. Celtic engagement rings are a gorgeous option, and some designs even feature a sapphire. This pretty 14k white gold ring has a square 0.9-carat natural blue sapphire centerpiece. The gem is flanked by two Celtic knots and features 20 tiny diamonds flowing down the sides of the band. It retails for about $750. Lab-created sapphires also make a lovely, affordable choice as a centerpiece for your engagement ring. This pretty design has a heart-shaped lab-created blue sapphire which is set in an embrace-style band encrusted with colorless diamonds. The setting is 18k white gold. This ring retails for about $330. A star sapphire is a particular type of sapphire that has a star-shaped inclusion in the center of the stone. These gems are typically cut as cabochons to show off this beautiful star pattern. 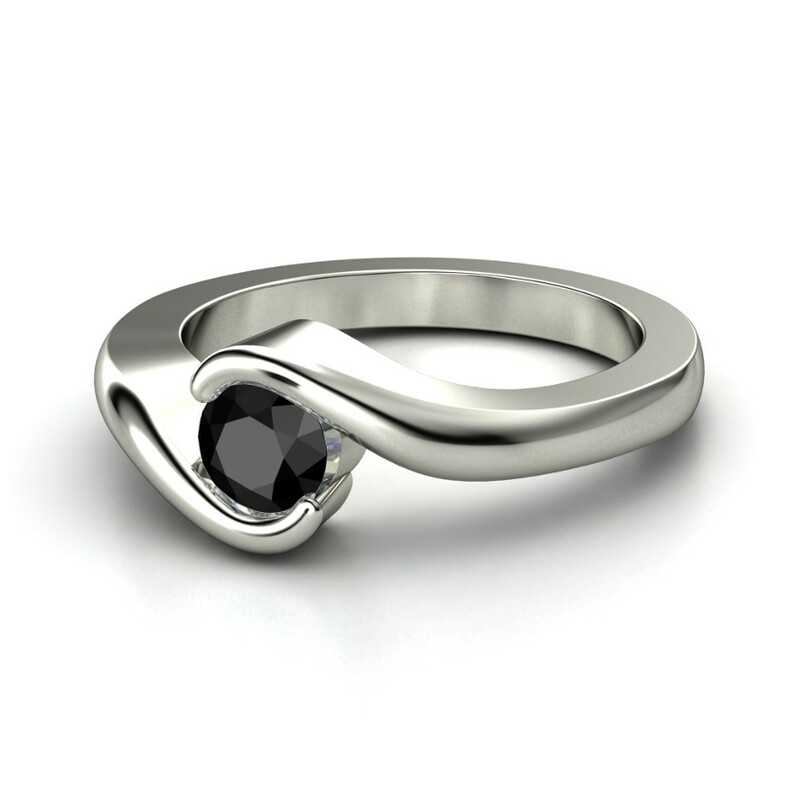 A star sapphire engagement ring makes a gorgeous, non-traditional choice. This natural star sapphire ring features a blue 8 x 6mm center oval gem flanked by tiny diamond accents in a 14k white gold setting. It retails for just under $300. Although most people associate sapphires with the color blue, they actually come in a range of fancy colors. One of the most popular choices is pink. This 14k rose gold ring features a 2-carat deep pink cushion-cut sapphire surrounded by a ring of white diamonds. More white diamonds decorate the twisted, split-shank band. This stunning ring retails for just under $2,900. Like yellow diamond engagement rings, pieces featuring beautiful yellow sapphires offer a new twist on the traditional. The sunny yellow sapphire is surrounded by a unique shape of prong set round, colorless diamonds. The band also features diamonds for a total carat weight of 1.23. This ring retails for about $1,600. With all the fancy colors and exquisite designs, it's always a good idea to view pictures of beautiful sapphire engagement rings before you decide on one. No matter which color, setting, and design you choose, you'll know that this is a ring you'll love for many years to come.